Welcome to this year’s hidden-indie wonder. Rachel Getting Married, Jonathan Demme’s new mini-masterpiece, is completely alive. 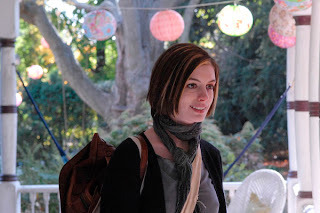 Kym (Anne Hathaway) gets a temporary release from rehab to attend her older sister’s wedding. The funny, educated Rachel (Rosemarie DeWitt) is getting hitched to subtle musician Sidney (Tunde Adebimpe, lead singer of indie-rock bank TV on the Radio), at their beautiful childhood home. The film follows Kym around for the wedding weekend. We meet her protective, flamboyant dad (Bill Irwin), old friends, step mothers and so on. But what we’re privy too, and what we notice right away, is the tension between these people. To call this family dysfunctional would be a complement. They have past tortures (mostly caused by Kym), that has all but ruined them. The characters engage in long, brutally honest conversations that feel as authentic as any conversation I’ve heard in film. Many of these scenes are hard to watch, due to their shear realistic nature. There is one such scene, when Rachel blows up at Kym in front of the whole family, that felt like it was taken right out of my own life. I’ve had conversations like these, I’ve lived through some of these times. And that’s why Rachel Getting Married is so brilliant, it touches chords in us that are rarely exposed in the film medium. Anne Hathaway is a revelation. You don’t too often find a character in rehabilation who is actually happy to be there. There is no relapsed scene, no use of drugs at all in fact, there is just a blatant honesty that echoes off the walls. Each one of Hathaway’s scenes is better than the one before. She’ll grab you just as easily in an NA meeting as she will fighting with her mother (Debra Winger). This is a flawless performance. Oscar, here she comes. While I was so utterly impressed with Hathaway, it must be said that the real marvel here is DeWitt. I can’t recall seeing her in anything before, but she’s the one that has stayed with me. DeWitt gives Rachel a presumed innocence of a life lived in the shadow of her troubled younger sister. But don’t let her charm fool you. Rachel is ready to go pound for pound with any family member, her wedding be damned. There is a scene towards the end of this film, involving a long hug between mother and daughters, that could very well earn DeWitt an Oscar nomination, or even the award. This is one of those "real" movies that only comes around once in awhile. When you see this film, keep watching Anne Hathaway's character, Kim, throughout each scene. She's often in the background subtlely doing a variety of things with her gestures, eyes, etc. This is the movie of the year filled with excellent perormances!! Please go and see it.